A strategy for the future of business. 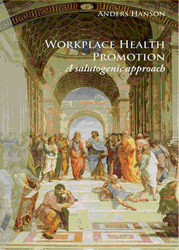 Read about how workplace health promotion contributes to this with a salutogenic approach. "This book takes the Ottawa Charter for Health Promotion one step further"
The idea of salutogenesis and Aaron Antonovsky´s theory of Sense of Coherence(SOC)* form importing starting points for this book. * See, Antonovsky: Unraveling the Mystery of Health,Jossey Bass Publishers 1987.